Robert P. “Bob” Mayberry Jr., who passed away in 2012 after a battle with cancer, was a member of Clemson’s much-touted 1981 National Championship football team. When his friends and family remember him, however, it’s not for his exploits on the field. They remember the way he went about helping other people. “Quietly and without the need for recognition,” is the way Kendall Alley ’83, M ’85, another member of that team, describes it. 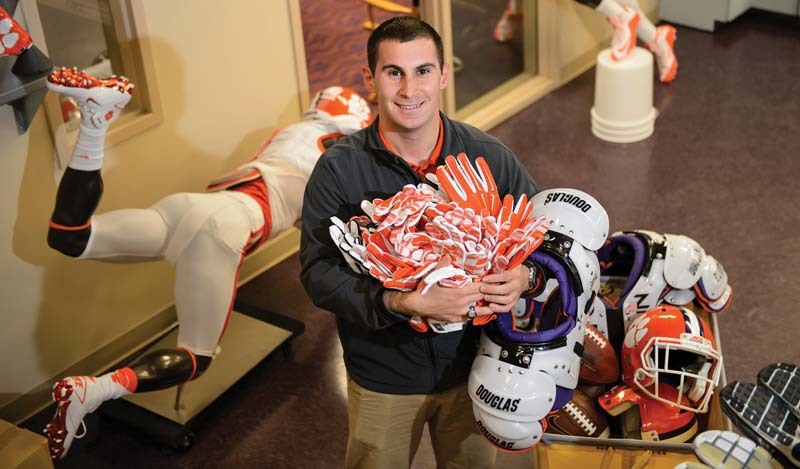 In the Clemson football equipment room, you can find one of those unsung heroes. Chris Egan operates under the same philosophy that characterized Bob Mayberry. He quietly goes about his job of cleaning helmets, organizing gear and toting bags of footballs on and off the field. Egan’s life has not been easy. His family moved around 11 times before he was 12 years old, so his mother home-schooled six children. When he was 13, his father left, and his mother went to work outside the home, still managing to homeschool the kids. Chris dropped out of school at 14, working odd jobs to help support the family. During what was supposed to be his senior year in high school, he took the ACT and spent a year at Greenville Tech; the next summer he worked at Camps Hope and Sertoma, based at Clemson’s Outdoor Lab. It was during that summer, working with special-needs adults and kids from underprivileged families, that he began to find his calling. The next year, he transferred to Tri-County Tech, continuing to work at the Outdoor Lab. A chance meeting with Alphonso Smith, head of equipment for Clemson football, would prove beneficial. Egan applied to Clemson, knowing he would have to pay his way through loans and part-time work. He contacted Smith, who hired him for a position, one with long hours and not much recognition. Being an equipment manager is not Egan’s only job. He lives and works at the Outdoor Lab as well. And he works with the ClemsonLIFE program, teaching classes for young adults with disabilities. During the summer, he is assistant director of the two camps at the Outdoor Lab. Along the way, he has finished his degree in history and begun a master’s degree in public administration with a focus on working with nonprofits. When the scholarship committee came looking for recommendations, equipment manager Abe Reed answered without hesitation. During spring practice, Reed stopped Egan on the way out of practice, took the ball bags from him and told him he needed to talk with someone. Heart in his throat, not knowing what to expect, Egan went in to find Mark Richardson waiting for him. The two talked about the scholarship and about Mayberry, and Richardson had a chance to gauge the young man for himself before signing off on the selection. Chris Egan signs his name on a lot these days. Without looking for any recognition or special attention. Just the kind of thinking Bob Mayberry would appreciate.